A late summer bloomer that is definitely worth the wait! Large white flowers have a beautiful lacy centre are produced from August and into autumn. Growing up to 2.5m with flowers up to 12cm across, this will certainly make an impact at the back of a border. Flowers August-October. Plant height 60-90cm, supplied in a 3 litre pot. 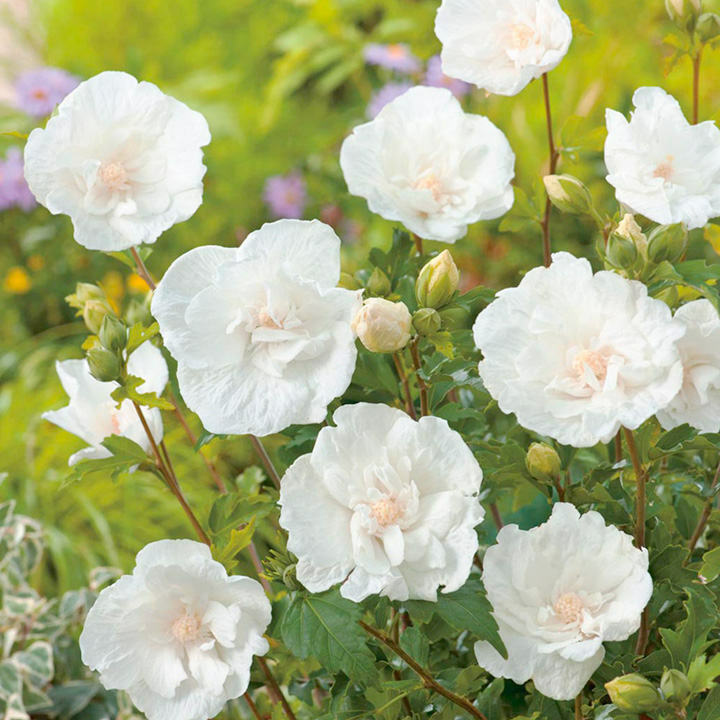 One of the most prolific and longest-blooming varieties of hibiscus, with the most elegant tissue-paper-like flowers! Boasts beautiful double and semi-double flowers up to 10cm (4") across, composed of tissue-paper-like petals, the lacy centres creating an anemone-like appearance. It’s a good choice for creating a ‘wow’ effect on the patio and showing off other plants in borders. The deciduous plants make a fine background planting to other low-growing shrubs, annuals or perennials. And this is one tough plant - a strong, vigorous grower, untroubled by pests and diseases and able to maintain itself through good weather and poor alike!